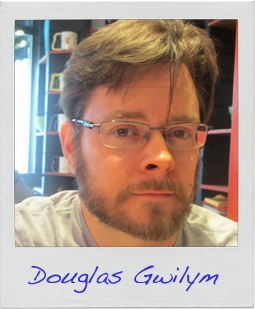 Douglas Gwilym is a former background investigator, DJ, rock-n-roll singer and bassist, grant writer, graphic designer and academic. He and his wife live with their articulate and wild-haired toddler in America’s most livable and historically peculiar city (Pittsburgh). He edits scholarly works for fun and profit under an assumed name, and has written many short stories and two novels of the darkly fantastic. Read the first page of Douglas’s story!